I started using personal kanban boards about 10 days ago. They are visible on the wall behind me when I videoconference with people, and many people have asked me about them during our calls. So, here is a post about why and how I’m using kanban boards, and the value I’m getting from them. Who isn’t busy, right? I find it hard to resist a good opportunity or idea, so sometimes end up with a lot of projects on the go. I’ve tried a range of ways to prioritise and manage my time across projects, business development, recurring tasks, administration and other activities. I like the portability of electronic tools that synchronise across multiple devices, and have been using the 2Do app for a couple of years. However, it can be time-consuming to enter and maintain all tasks in an electronic tool. When I get really busy I revert to sticky notes and scraps of paper. It’s quick to hand-write a new task on a paper note and easy to sort and shuffle them as priorities change – definitely quicker for me than with online tools. It gets tasks out of my head, so helps me to concentrate on whatever I was working on when the thought of the task popped into my head. However, there are still a lot of things on the list, which is now less portable. The long electronic list has been replaced by a growing stack of notes. Either way, they require regular review to figure out what I should do on any given day. I’m concerned to ensure that at any given time I’m working on my most important activities (I use the Eisenhower matrix to help identify what these are – but that’s not the focus of my post today). I decided to create a board for each of my top 3 projects (rather than one board with all projects mixed in together). The 1-minute Snapchat video below outlines how I set the boards up. I have since added a fourth board for a client project. I’ve been using the boards for a week. Every morning before I set down at my desk I check the boards and decide/confirm what I need to work on that day to progress my most important projects. I add new tasks on a sticky note (1 task per note), and sometimes replace a high-level task with multiple more granular tasks. I update the boards as I work too. I’m finding the process very fluid and the boards are definitely assisting me to prioritise and progress my most important projects. Importantly, using them also decreases my mental chatter about what I should be working on. Another disadvantage is that they cannot be shared with other people so don’t help with collaboration. Some people in my network use Trello, which uses a board structure for task management. I downloaded Trello several months ago, looked at it briefly, and deferred figuring out how to use it. I suspect that the practices I’m using with physical kanban boards would transfer readily to Trello. This tool is obviously portable and could be used with others. I think I would miss the immediacy and visibility of the boards on my office wall were I to move from using them to Trello. Of course, practices evolve so I may well be posting about my use of Trello (or something similar) in the future. This entry was posted on July 10, 2017, 6:34 am and is filed under Michelle Works Out Loud, Productivity. You can follow any responses to this entry through RSS 2.0. You can leave a response, or trackback from your own site. I’m still struggling to find a good process that leaves nothing behind. Suddenly I realized that I use a personal kanban for chores. I have magnets on the fridge for each of them and I recycle them regularly to make sure they get done. I’m dubious on the board per project. The idea of kanban as it came from Japan Manufacturing is to lead by void. Each completed task call for the next one. The system emphasizes capacity over back log. This was eased by the fact that it’s production: repeating the same task again and again. Each task should be of comparable size ( 2 hours?). Hence the need to sequence some long tasks. This put those tasks in a special state, they are started but will not finish easily. Next is capacity. In your case you state 3 tasks as capacity of your central column. This your personal throughput. On your daily todo list you place 5 + 5 = 10, If you have 3 board it’s 9 tasks, add one more you have 12 tasks and you are over capacity. so IMHO the on progress column should reflect your personal capacity across all you do. I tried to work with todoist last month but it didn’t work well. I ended up coding a few things to make it work as I need it. It started a long facebook discussion. I realized that most people favor pen and paper or post-its. What about a kanban in a booklet? Keep the backlog (first column) like a bullet journal, one per project, the ongoing column as a short todolist, the done as an achievement display. I like the fridge magnet kanban for domestic chores. I always forget to water my plants – this could help. I think when we pick something up out of an organisational context and apply it personally then we can adapt it to figure out how it might work for us. And it’s good to know what the original concept and application was – the principles behind something. As an aside this reminds me of a ‘Creative Design for Embroidery’ course I once did where we had to learn the proper way to do each stitch before we then started breaking the rules and bringing out own flair to how we used it – eventually combining stitches and techniques in our own way. As for capacity, this is an excellent lens to bring to whether any personal management system serves us well. I’m constantly juggling capacity and seem to always get through things, but often with some wear and tear. So now you have me thinking more about this as the key challenge. I haven’t actually been putting 3 tasks on each board as this is too much to make progress on. However, I still have too many tasks on the go at once. What I have realised is that list style of to do management runs away from me, even with a good tool. I also find most systems too time-consuming to maintain. I suspect this is why I revert to paper when I get really busy – pieces of paper are quick to write and shuffle around. Big disadvantage is they are not portable and it’s easy to lose some of the paper. Today I am moving from my paper based kanban boards for highest priority projects to Trello. I bought Trello 6 months ago but when I looked at it didn’t immediately get how to use it and didn’t allocate time to understand it. Now that I have used paper-based kanban boards I can see immediately how to use Trello and will give it a try for a couple of weeks. For things other than these priority projects I’m going to resume using 2Do. Will see if I can figure out how to use these two tools side by side to capture all that I need to work on and manage them in a way that is efficient and helps me to clarify my capacity. I’m curious how others approach capacity management. You’ve identified the heart of my challenge. Don’t you just wish you were the person who invented post-it notes? I mix a post it note process for immediate tasks (one of which just has MIT written on it, as in what’s the Most Important Thing today? ), a weekly planner (hard copy but loose leaf so it both travels with me and sits out visible on my desk), and a mind map in my (line free) A4 note/draw book. The mind map is consulted when setting up the weekly planner, and is added to or crossed out as projects come or get completed. When it becomes a shambles I create a new one (6-8 weeks), tear out the old one and shred it (I think that’s the most satisfying part). The key to capacity management for me is the weekly review/planning process. This takes about half an hour up to an hour: Check/chuck the post its, check the projects mind-map, write the week planner and translate to digital calendar as required for time-sensitive things. The headspace for this process is quite big and includes wellbeing measures, knowledge/skill needs, network state/contribution levels, EQ and purpose/motivation/meaning. The written weekly planner is relatively new (2 months ish) but became important as demand levels increased. I’d say it has increased my (work) capacity, but has come at a cost which I’m now working to reduce! Yes to collecting royalties for the rest of my life on sticky-notes! Sounds like your process is all hand-written Neil, with the exception of the digital calendar. It sounds like you’ve found a system / process that works for you – well done. I agree with the value of a planning routine and have a cycle that runs from quarterly to daily which I follow with varying levels of discipline. I like planning, but find I can over-plan and then maintaining the plan as things change is challenging. For me, the element that I need to pay more attention to which is emerging from this discussion with you and Bruno (and also Michelle Parry-Slater on Twitter) is that of capacity management. Our planning routines need to be within our capacity to sustain. We also need to look closely at capacity as we commit to projects, activities /tasks and figure out how to balance taking on good opportunities and working efficiently while protecting the standard / quality of our work. Part science, part art. Shall keep tinkering. 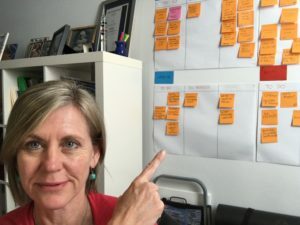 Hi Michelle, Personal Kanban Boards are probably the best way to go when you like to visualize your workflow and see where the bottleneck is. I am using physical boards at the office for brainstorming and tracking teams activities. However, the best way to benefit from the Kanban methodology using personal Kanban boards is actually using digital Kanban boards which can be applied to email, for example. Imagina an application that transforms your email inbox into a Kanban board with a beautifully visualized workflow. Such a tool we developed (first, for our internal usage) is Flow-e (https://flow-e.com). You can try it out (it’s free) and let me know what do you think. Thanks for this information Mila. It turns out after trialling both hard copy kanban boards and Trello for electronic boards, that I’m one of those people who is better off working with lists than boards. I’ve reverted to 2Do to manage my tasks. Perhaps there are others who would find your tool useful.